Sales technology has become increasingly popular over the last few decades, and it continues to be one of the best ways to help salespeople meet their goals. Without a doubt, sales is becoming more technology-driven as more companies are beginning to invest and incorporate the new science of S.T.E.M or Sales Technology Engagement Management into their sales teams. Sales reps are usually expected to sell more and sell faster, which means they have to take advantage of these technological shifts. Many salespeople feel that their sales process is disrupted because they’ve had to change how they engage with customers, coworkers, and prospects. However, the new science of sales technology enablement management (S.T.E.M) allows salespeople to work smarter and efficiently by arming sales reps with technological tools to smoothly navigate each phase of the sales process. Understanding S.T.E.M and how it can work for sales teams is critical to enhancing the productivity of your sales force. Related Reading: What Digital Selling Skills Do Sales People Need To Be Successful? 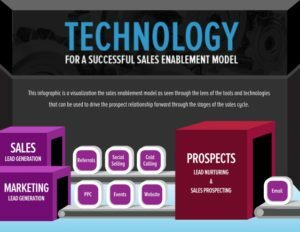 Sales Technology Enablement Management is a necessity now because technology isn’t slowing down or going away. The way companies keep up with sales technology impacts the way sales teams work together and how they interact with customers. Learning how to master the new science of S.T.E.M is critical to the success of sales teams. For the most part, sales reps want to learn the new technology and use it because they know it can help them work smarter. The demand for sales representatives with S.T.E.M skills has been more important now more than ever due to the ever-increasing amount of information that is available to both buyers and sellers. The new science of S.T.E.M. has changed the selling landscape tremendously by allowing access to data and insights that were not as accessible before. This access to data has leveled the playing field for sellers and buyers alike. Getting real or quantifiable results are based on science. Sales Technology Enablement Management means that you have a plan in place and a strategy that works. You must ask plenty of questions. Sales reps must determine what their target audience is and what they need. You also have to research everything, determine a hypothesis and then test the hypothesis. During the testing phase, you should gather appropriate information and analyze the data to determine the outcome. Talk with others in the firm about your results and determine if that is a viable solution. If you think it could be better, you’re more than welcome to research a little more, create a new hypothesis, and test it, as well. Continue with the process until you find something that works for you and your team. In some cases, it may require a few tweaks to the overall strategy, or you may have to change everything completely. The new science of S.T.E.M. is critical to improving modern sales teams and their sales strategies. New S.T.E.M technology supports sales teams by allowing them to utilize technology that can enhance sales productivity and analytic skills. While traditional selling practices should not be abandoned, implementing S.T.E.M. best practices with sales training shows great promise for enhancing productivity and overall performance of sales teams. The Sales Coaching Institute newsletter!